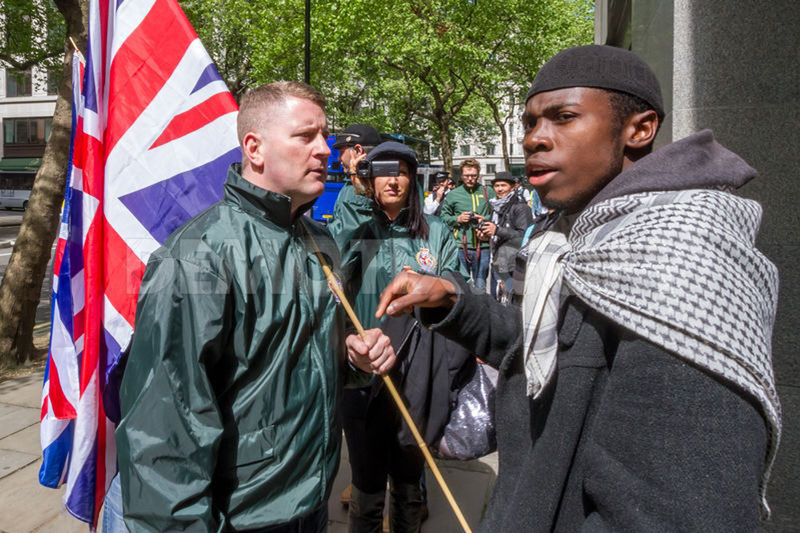 Brusthom Ziamani pictured on May 2014 outside the Indian High Commission in London confronted by Paul Golding (R) of Britain First Nationalist movement. 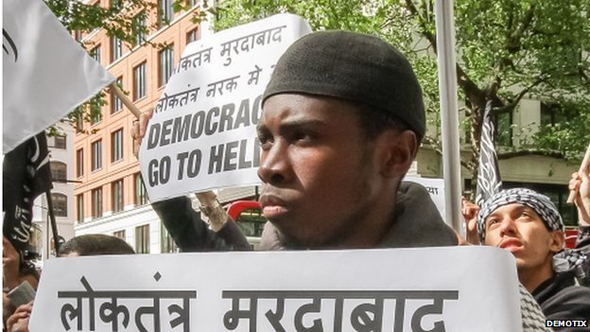 Brusthom Ziamani, 19, was also carrying a hammer and an "Islamic flag" when he was arrested in London, in August 2014. Commander Richard Walton, from the Metropolitan Police's counter terrorism command, said the teenager's plot "starkly illustrates" one of the threats facing the UK. "Ziamani was an impressionable young man who became radicalised then rapidly developed an extremist, violent mindset. "Over a series of months, he ultimately developed a desire to carry out a terrorist attack on British soldiers," he said. Counter-terrorism police had probably prevented a "horrific terrorist attack taking place on the streets of London". During the trial at London's Old Bailey, jurors were told how Ziamani had "reverted" to Islam at the beginning of 2014 and was arrested after he had shown his ex-girlfriend weapons. The court heard how Ziamani had fallen in with members of al-Muhajiroun - an extremist organisation - after he was "kicked out" of home for converting to Islam in early 2014. The jury of seven women and four men convicted Ziamani of preparing an act of terrorism on or before 20 August last year after deliberating for a day-and-a-half. Ziamani's barrister, Naeem Mian, told Judge Timothy Pontius that the teenager expected the sentence to be one of "considerable length" but pointed to the fact that he was still "a young man who has no previous convictions at all". The trial heard how Ziamani described Michael Adebolajo - one of Fusilier Rigby's killers - as a "legend" and had told his ex-girlfriend how he would "kill soldiers". When Ziamani was arrested in June last year on an unrelated matter, police found a ripped-up letter in his jeans pocket, in which he had written about mounting an attack on a British soldier. However, Ziamani denied he had been planning a copycat terror attack, similar to the murder of Fusilier Rigby. He said his Facebook postings had been an attempt to "fit in" with the al-Muhajiroun group. He told the jury: "I did not believe it. I wanted to fit in with these people because they were giving me places to stay and they did not like moderate Islam."